Off topic need to build a Recirculating water system for my still ideas and opinions? 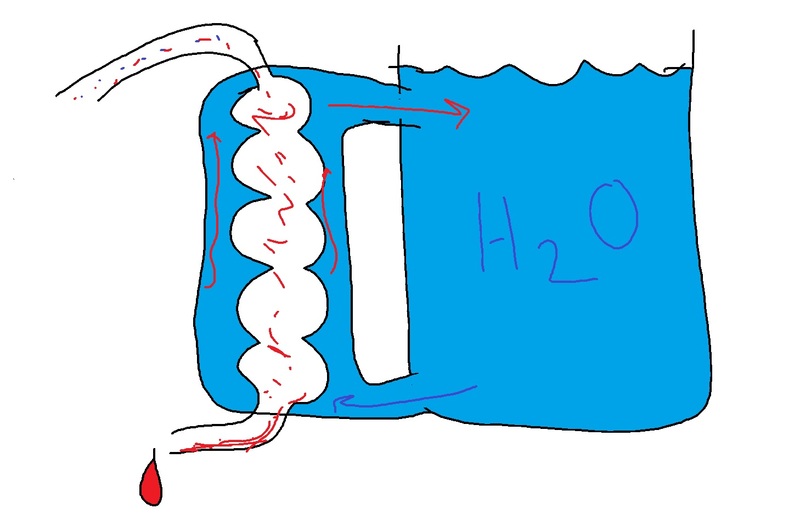 Thread: Off topic need to build a Recirculating water system for my still ideas and opinions? I have some experience with the process having worked in the industry for a while, I would say that 4-5 hours does seem a long time to run a pot still unless your heating is quite poor. If you like pm me. split output line of your pump with a ball valve on each with one running directly back into reservoir the other into still adjust flow by closing off each valve to get required amount.i would think a 200 litre plastic drum with a small bilge pump or aquarium pump would be the go.if you need cooling for your outflow a 60 litre drum with your out let pipe running through it in a couple of coils in the drum filled with iced water or a heat exchanger pipe with water from your house supply running back to your house tank so not losing water.you can make a heat exchange unit out of pvc pipe and fittings but drum would be cheaper but you will need ice. Interesting you say 200lts why do you think it needs to be so big? With 2 or 3 ice cream container size blocks of ice floating arround in there should keep it cool enough? recirculating water back to tank is a couple garden hoses kept solely for this ends sealed when not in use.if you go with reservoir more water in reserve better heat reduction in holding tank plus you can use a bigger pump if more economic to purchase.slower you recirc total water better heat dissipation ,also depends on water temp leaving still as a high temp will melt your ice quickly and lift temp in your reservoir.you could also wrap a pipe around the pipe exiting still and pump water through it back to your house tank using house pump as a pre cooler to keep temp lower in your reservoir. flow through the condenser should have the distillate coming out at the same temp as the water is going in. Over 5 hours to get 2 litres of absolute alcohol from a reflux still you will have boiled off and condensed near 10 litres in total. Assuming your water comes on at 15C and if you are 60C outlet temp there is 3.14kW heat to remove. Latent heat of freezing for ice is 334kJ/kg. That’s around 35kg of ice over an hour. To get your surface area up your going to want to add ice in smaller amounts over time. Servo bag of ice is 3kg and $5 a pop. So you need 12 bags of ice or spend $60. Fill a tank. Drain to waste. Forget the ice. Forget the pump. Do it simple. Marty Henry and Tommy like this. Consider really old cars did not use to have a water pump for their coolant systems. Worked by natural convection currents, warmer water rising, etc. Just need sufficiently thick hoses to minimise flow resistance. Drew the hooch red to warn of its potential effects on liver, family life, blood pressure, etc. Enjoy.